Standard - $80.99 X-Large - $80.99 Only 6 left! You know, everyone thinks it’s just so cool and mysterious to be a bounty hunter. But do they ever stop to think about what that kind of life is really like? Do they ever give any thought to the man inside the bounty hunter suit? Listen, you animals, he’s not just a killing machine, constantly on the hunt for his next bounty. It might look like that, but you’ve gotta look deeper! What drives him to be a bounty hunter? How did he get here? What happened to make him this way? Yeah, sure, he’s the unaltered clone whom bounty hunter Jango Fett raised as his own son, but, really…between then and now, what happened along the way? At one point, he must have had dreams…and feelings… Did you ever stop to think that maybe he might be a little tired of being judged on just what he does for a living? What if he’s on a constant quest of seeking out a fulfilling personal life, of which we know nothing about? Perhaps he loves working with his hands, or making art out of objects found in nature…maybe he’s a movie or book buff, intoxicated by the idea of being able to float away to another world just with the turn of a page! 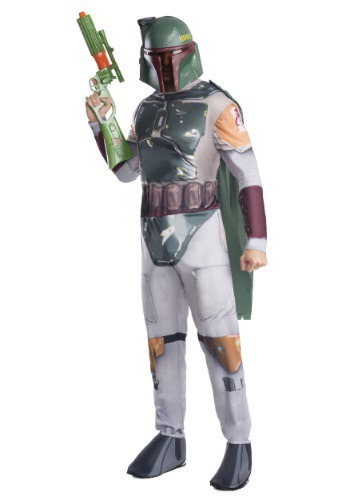 So yeah…what we’re trying to say is…when you look at this officially licensed Adult Boba Fett Costume, don’t just see the kind of bounty hunter who gets hired by Darth Vader and employed by Jabba the Hutt. Look to see the man behind aura of danger and mystery!